LONDON--(BUSINESS WIRE)--Technavio projects the global stationary fuel cell market to post a CAGR of over 22% during the forecast period. The rapid increase in power consumption has led various countries across the world to decarbonize the power system thereby increasing the demand for a clean and efficient power source. The adoption of fuel cells is gradually increasing owing to its higher efficiency, and environmental benefits. The adoption of distributed energy generation is primarily driven by the growing need for uninterrupted and reliable power supplies in developed countries to increase the electrification rate. Instances of natural calamities disrupting continuous flow of power have led customers to seek increased reliability and resilience. Residential users are increasingly opting for self-generation of power as it enables freedom from power grid failure and offers cost-saving on energy costs. This market research report segments the global stationary fuel cell market into the following applications (prime power, CHP, and others), and key regions (the Americas, APAC, and EMEA). The prime power segment dominated the market in terms of MW shipments with over 67% market share. This segment is also expected to have the highest market share during the forecast period. This dominance is attributed to the development of multi-MW scaled fuel cells parks and its installation in power critical buildings. The prime power segment was followed by the CHP segment and the others segment. In 2017, the Americas dominated the stationary fuel cell market in terms of MW shipments accounting for a market share of more than 38%, followed by APAC and EMEA. However, the market share of the Americas is expected to reduce by close to 4% while that of APAC will increase by over 5% to surpass the Americas as the largest region by 2022. 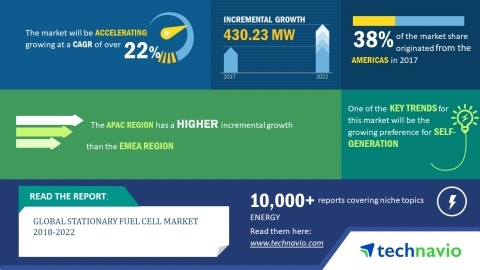 Technavio projects the global stationary fuel cell market to post a CAGR of over 22% during the period 2018-2022.